3TJW (Waterproof Jumbo Toggle) and 3PJW (Waterproof Jumbo Pushbutton) are withstand the server environment of a construction site. High evaluation. Waterproof performance IP67 (waterproof panel). 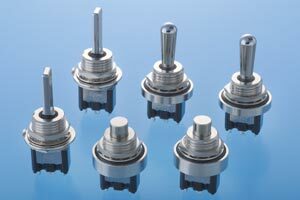 3TJF (Jumbo Flat Toggle) is also available.